The Importance of Earnest Service » Blog Archive » Service of When Technology Lets You Down—Or Is It The People Running It? Service of When Technology Lets You Down—Or Is It The People Running It? I was depending on a bus to get me inches from our apartment one Saturday morning. The stops for the so-called First Avenue and 42nd Street Limited aka express bus and the local are almost a block apart and neither are on 42nd. 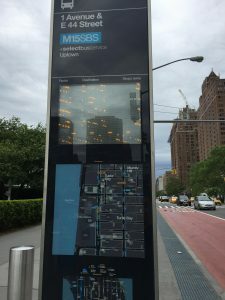 An electronic sign reporting the whereabouts of upcoming busses [photo above] stands between them. I ran away from the local stop to read the sign. Great: The local bus I’d hoped for was two stops away. When I turned around to walk back, the local was just pulling out of the stop. I whirled around and just then the sign changed from “2” to “0” stops. I’d missed the bus. So what was the point of the electronic sign? A day later I was upstate heading into the Metro North Dover Plains station’s parking area half an hour early. Two busses were leaving and I waved at one of the drivers who didn’t stop. Without advance notice [the day before there was nothing online about busses replacing trains on Sunday], the RR line substituted a bus for the first lap of the trip to NYC. So what, you say? This switch makes a big difference to riders: when the 12:37 train changes to a bus, departure is at 12:03. The next bus? Two hours later at 2:03 according to an MTA employee who saw me and my car and the busses and sat like a lump in a white sedan with MTA logo. In the course of that weekend, I was driving through Dutchess, Putnam and Westchester counties, the Bronx and Manhattan as well as around Long Island. 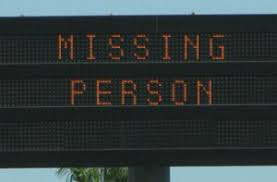 I saw the same electronic sign on all the highways asking drivers to look for a “missing adult in a black Honda.” On Saturday the license plate number given was longer than any I’d ever seen: Clearly a mistake. By Sunday this was fixed. What didn’t change was the “adult” reference. Were they looking for a man or woman? Can you share examples of where technology—or the person operating it–has let you or someone else down? This entry was posted on Tuesday, May 30th, 2017 at 10:17 am	and is filed under Manners, Technology, Transportation, Travel	. You can follow any responses to this entry through the RSS 2.0 feed. You can leave a response, or trackback from your own site. Let’s be realistic. Technology is wonderful. However, now that virtually every product we use and touch, is connected to the Internet, isn’t it more surprising that more doesn’t go wrong? Don’t get me wrong, I’m not a naysayer, I do appreciate the ease and convenience, and we are just a step away from totally self driving cars, but it’s almost too miraculous to keep working without a failure or Two! No? You are right. But this was three in one weekend! In two of three instances, it wasted my time, potentially making me late to a wedding. For a couple trying to get to JFK to fly to Europe, the Metro-North error may have cost them more than time if they missed their flight. The solution would be to throw money at two of the three situations: I could have taken a taxi and not plan on a bus that lands me steps from my apartment and the couple going to Europe should have paid a driver to take them from upstate to the airport. We should count on public transport only when we have all the time in the world. Tehcnology provides the visual information which may or may not reflect errors. However there needs to be coordinated thinking, study, research and planning,and coordintion which can all be augmented by technology to make things function properly. There is no reason to not have more centralised scheduling and inter service communication. In 1979 or 1980 a researcher from MIT’s Center for Transporataion Center Studies referered to the English system of Dial a Ride which was a foreunner of the greater Boston mysteriously operated Ride, which may or may not come within hours of the time requested for an appointment. The same researhcer said that as a nation we had to update and expand our railways because that was the most efficient means of transportation for us. Skies, he said, were already overcrowded. Now–as predicted–we have arrived at a point where plane transporation is unpredictable, uncomfortable, horribly inefficient and fraught with risk. Services like Lyft and Uber are added to the transportation mix today. In my opinion, these drivers are not sufficiently vetted. In addition, terrorism and violence makes even the more appealing modes of transportation less so. There are so many potential gaps between technology and service at a good price and I fear there will always be. Take Uber. If you want to get somewhere at a certain time you must pick the more expensive option with you and your colleague/companion alone in the car. With the cheaper jitney style option, you cannot control when you will be picked up or what time you will arrive. It works ONLY if you are leaving over one hour earlier than normal or have only one thing to do in a day and when you arrive doesn’t matter. The same goes for busses. You cannot count on them. Subways are a little better when they are running. Often, because they haven’t been maintained, one or the other of them will break down and service stops. Or the MTA decides to repair tracks. So you can’t always count on subways either. As for terrorism, John and Jane Q Public can’t function if they think of it. You just can’t let it stop you. I think the answer to your question is something else. Many years ago I took on managing a chunk of the business of an active international bank. It was a fun assignment because of the multitude of problems which faced me, some apparent, some not so apparent. And one of the biggest of these was a not so apparent one. Nobody had done much to bring our computer systems up-to-date in ten years. Why? Because the whole bank supposedly was just about to adopt an integrated system of its unique own design, which had been under development at vast expense, the “Future System,” nobody wanted to spend money on fixing what we already had that didn’t work. Eventually, the bank junked the “Future System” in its entirety, took a write-off of a couple of hundred million, and bought “cookie cutter,” tried and tested, generic programs and upgrades which did work. The problem with technology, is that some of it is more useful, and some less, but the designers fall in love with that which they have created, whether useful or not. I agree with your last point about designers of technology falling in love with their inventions, but there is something even more basic: If they don’t come up with something new, they will have nothing to sell. This happens in all businesses: A doctor who recommends unnecessary tests; a marketing person’s irrelevant project for which they earn a kickback or a percentage from the client; a PR firm demanding an expensive market study made, of course, by their staff, before launching a program etc. The computer program you described was made either without consulting or listening to the bankers or maybe the bankers weren’t listening.